All image extracted with Video Image Capture App will be in full resolution without any alteration. This means if you use iPhone 5 to capture full HD video, the extracted images will be in full HD resolution (1920x1080)! 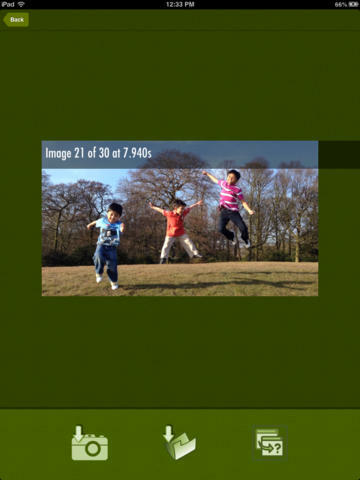 More over, Video Image Capture App has the 'BURST' feature that will allow you to select the video frame & all frames from 0.5s before & 0.5s after the selected video frame will be extracted & you will be given the options to browse, select & save the best images from the range. You can directly save the selected image frame to your camera roll or save it to the App's image folder. You can also copy the image to your clipboard / pasteboard & paste it to any supported App. With the file / image management view within the App, you can rename, delete or preview your saved images in your App's image folder. While in preview mode, you can export the image to printer, email, twitter, facebook or any other installed Apps that supports image viewing / editing i.e. Dropbox.